If there's any indication that this place is more than just a small country farming town, it's this vineyard. Off the road, down a narrow drive, nestled among ancient oak and hawthorn trees, there is an old neogothic-style abbey. A hidden gem in this rugged land of cactus and cowboys. Its spires are barely visible above the trees, which is probably why I've driven past it with out even noticing for so many years. 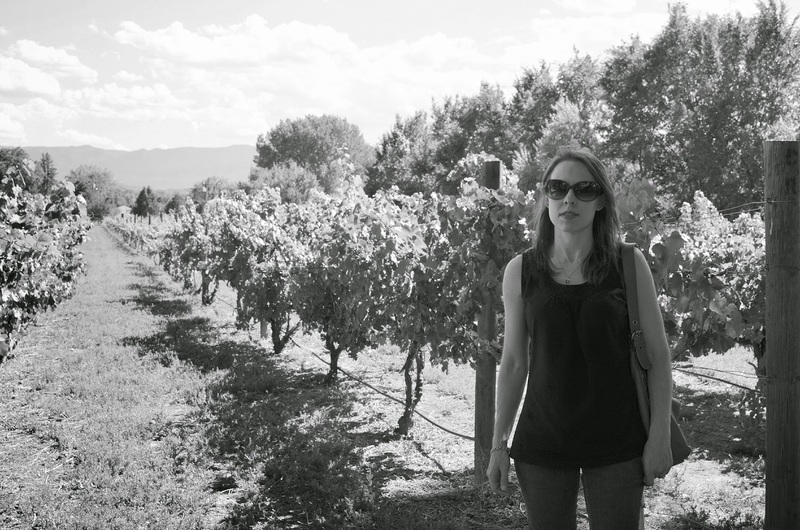 It's surrounded by vineyards, thriving in the rocky soil and intense Colorado sunshine. 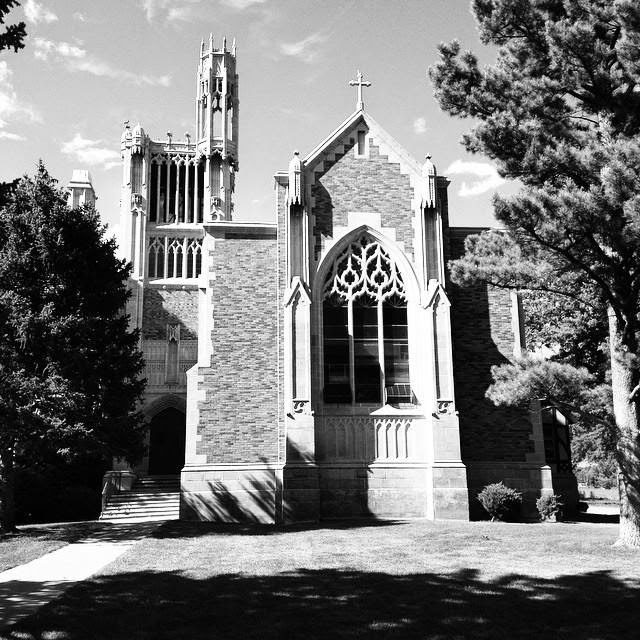 Though the abbey was built in the early 1920's, it reminds me of something much older. Like some of the grand churches in Europe perhaps, which is why I feel at home here. 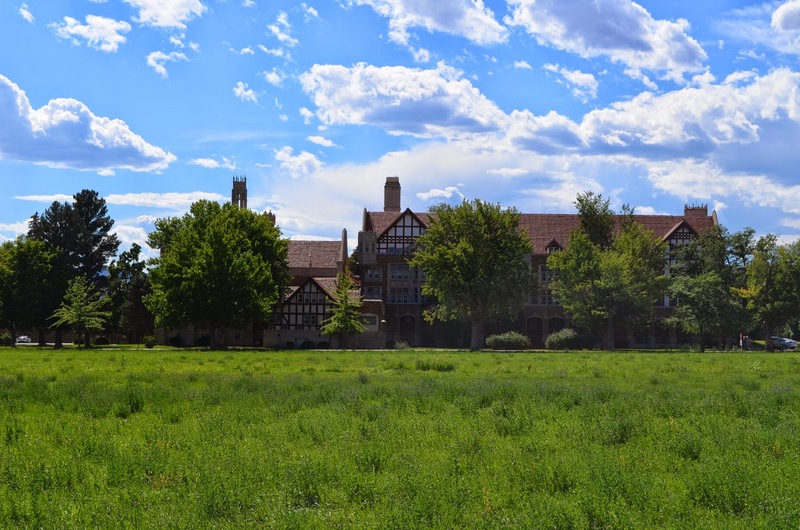 It was used as a boarding house and school for many decades, and the vineyards were planted by the Benedictine Fathers in the hopes of establishing a world-class winery here in the heart of Colorado. That never happened, and in the name of Progress, the abbey was eventually closed and abandoned. There's something to be said about progress, but that will have to wait for another day. Perhaps there's more to be said about the past. About ways that are lost and dreams that are forgotten. Recently the abbey was revived and restored by the historical society; the wild, rocky vineyards have been tamed and tended - and, better late than never, a winery was finally established in the out buildings behind the chapel. Using grapes from the vineyards as well as other varieties grown locally, these days the abbey produces some of Colorado's finest, most treasured wines. I was introduced to the wines of Holy Cross Abbey quite by accident one day. My brother, who happens to have a knack for choosing the perfect wine to go with dinner, brought over a bottle of 2009 Colorado Syrah. I was intrigued and decided that one day I must see the abbey for myself. My birthday last weekend was the perfect excuse for a trip to the country! The kids were both begging me to make carrot cake with a lovely bunch of carrots from the farmers market. So the day started with a compromise. 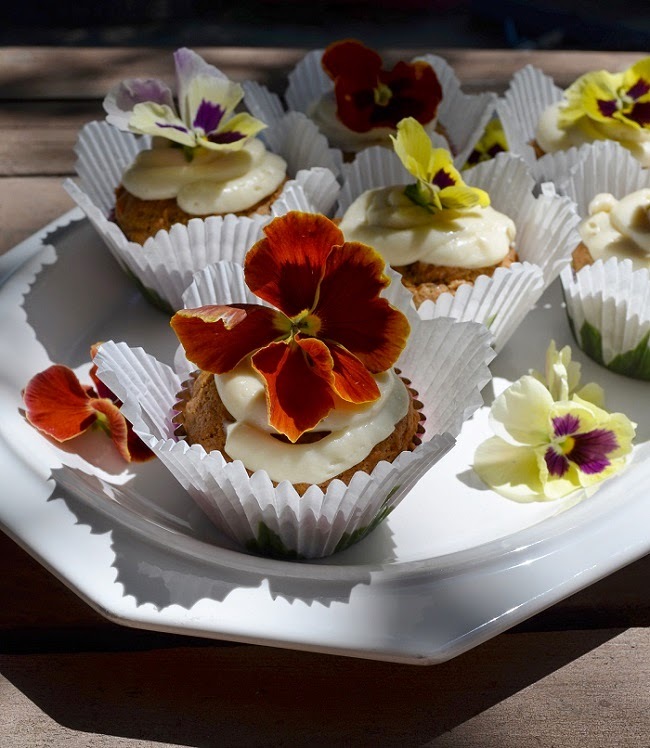 I cut the sugar and made carrot and cardamom muffins for breakfast (with whipped maple cream cheese on top) - to make an extra special birthday surprise, Eve decorated them with flowers from the garden. 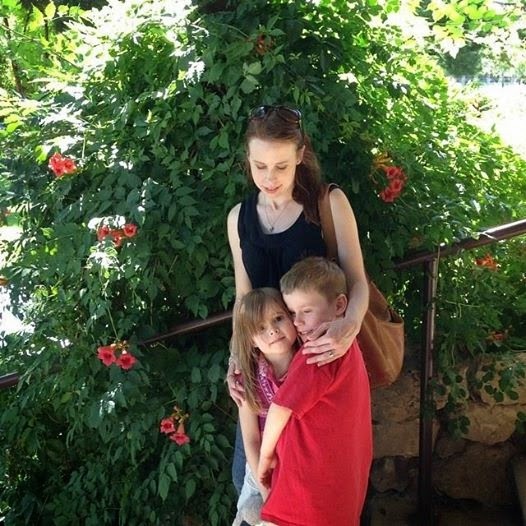 Then I packed a picnic lunch (and what was left of the muffins), loaded the kids in the car, and headed to the abbey. The grounds of the abbey are beautifully green, landscaped with the most vibrant flowers and trees. 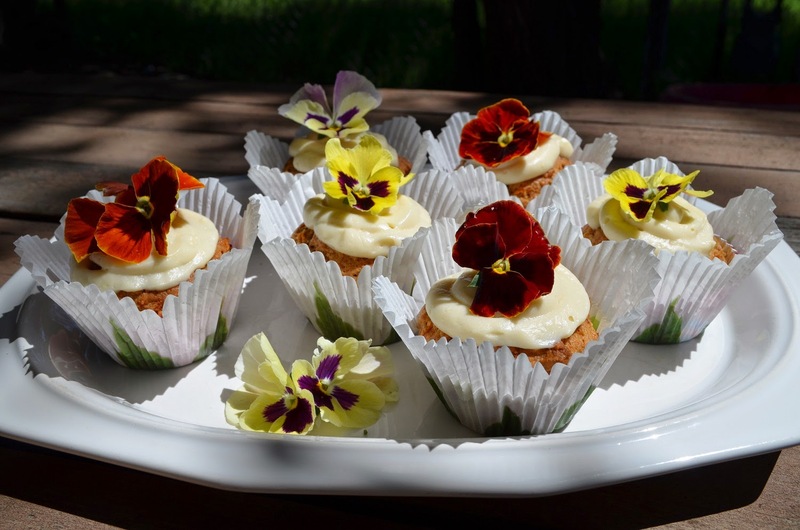 I'm sure our flower-covered muffins felt right at home on the picnic table in the shade of a huge cottonwood tree. Quite a change from the dry & dusty mountainous terrain just outside of town! A vast, park-like expanse of grass was the perfect spot for the kids to play while I set up lunch. After lunch we stopped in at the tasting room. Though we've had many of the wines at home before, in the hot summer sunshine I rekindled my love for a perfect, crisp, cold Pinot Grigio. I couldn't leave without a few bottles! On the drive home my mind was on the wine and what to serve with it. I decided to play with a traditional Bresse Chicken recipe. Though we can't get authentic poulet de Bresse in the U.S., I did have an organic, local chicken in the refrigerator at home. I roasted the chicken on a bed of potatoes, onion and bacon, at a very high heat. It was basted with chicken broth and the Pinot Grigio from the abbey, and it developed a rich, smokey flavour from the bacon. The potatoes below became crisp and creamy, like a gratin without the cream. I added sage, because my garden is full of it! I served it with a light green salad and of course, what was left of the Pinot Grigio. 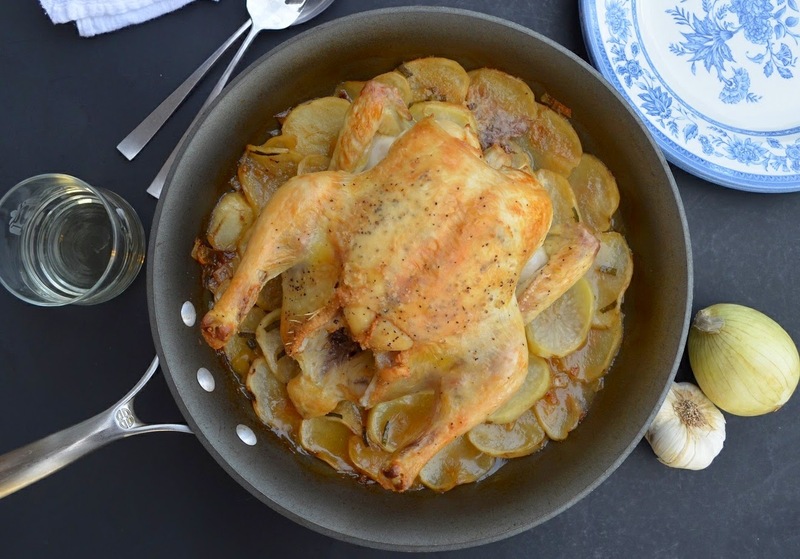 A simple one-pot meal, and an elegant way to end a day spent basking in the dreams of the past. 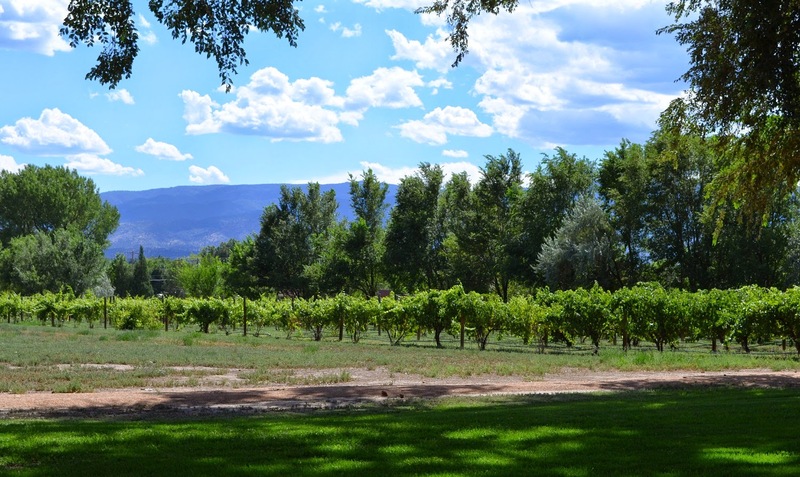 The Winery at Holy Cross Abbey is located at 3011 U.S. 50, Cañon City, CO 81212. Preheat your oven to 350 F (180 C). Spray a 12-cup muffin tin with cooking spray and line with paper liners. I spray the liners, too, to keep the muffins from sticking. In a large bowl, mix the flour, baking powder, baking soda, salt, cinnamon, ginger, and cardamom. In a medium bowl, mix the sugar, butter, eggs, carrots, and vanilla. Stir the wet ingredients into the dry and mix until evenly moist. Divide the batter between the twelve muffin cups. Bake for 28 - 32 minutes, or until a toothpick inserted in the centre of a muffin comes out clean. Cool and top with whipped maple cream cheese (recipe below). Beat all the ingredients together until light and fluffy. Spread or pipe onto the carrot muffins. Preheat your oven to 525 F (275 C). Set a large, oven proof skillet over medium heat. Cook the bacon until crisp, then add the onions with a pinch of salt. Cook, stirring occasionally, until the onions are soft, about 10 minutes. Add the garlic and cook a minute longer. Layer the potatoes neatly around the pan on top of the onions, to make a bed for the chicken. Scatter the sage leaves over top and sprinkle lightly with salt and pepper. Place the chicken on top of the potatoes and season with salt and pepper (both under the skin and on top). Rub the chicken with olive oil. Pour the wine into the pan and bring to a boil. Pour in the chicken broth and bring to a simmer. Place the pan in the preheated oven and cook for 10 minutes. Turn the heat to 400 F (200 C) and continue cooking for 40 - 50 minutes longer, basting once or twice with the juice in the pan. The chicken is done when a meat thermometer placed in the thigh reads 180F. Remove the chicken to a platter and rest a few minutes before carving. Use a slotted spoon to place the potatoes around the chicken. Carve the chicken and spoon over the juice from the pan before serving.